A Google experiment shows a special icon next to smartphone-optimized search results. Obviously, the icon is only displayed when searching from smartphones. Back in 2012, Google ran a similar experiment, but it never became a regular feature. Google has a few articles about building smartphone-optimized sites. Google supports three different configurations: responsive design (same code, same URL - Google's recommended configuration), dynamic serving (different code, same URL) and separate mobile sites (different code, different URL). 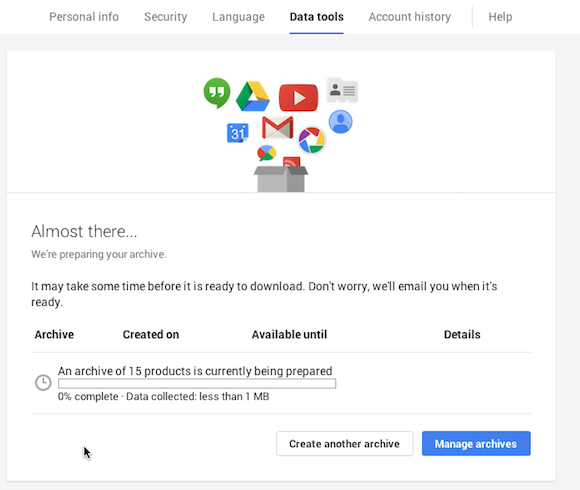 Sushubh Mittal noticed 8GB of bonus storage in his Google account. The bonus storage is for Google Maps Views and doesn't expire. 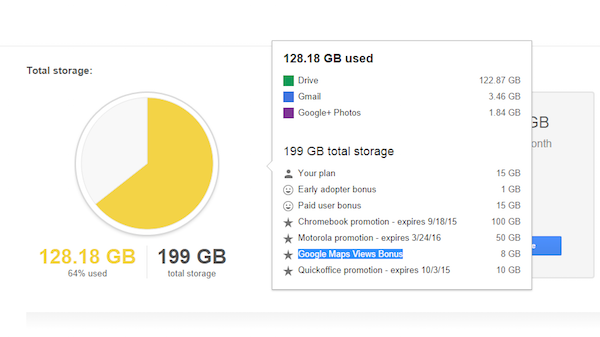 Other users got 15GB, 67GB, 72GB of free storage, so it looks like Google's bonus is not the same for everyone. 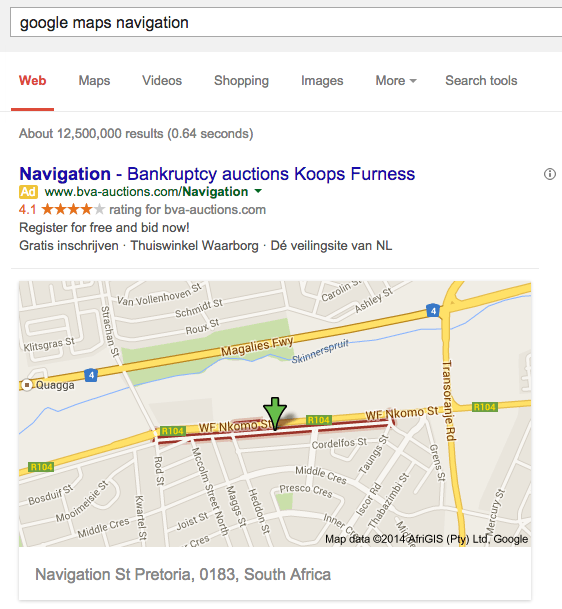 It's not clear how you can obtain the Google Maps Views bonus, but I assume it could be influenced by the number of photos and panoramic images you add to Google Maps Views, the number of photos approved to be displayed in Google Maps and their popularity. All the photos you've publicly shared in Google+ and they're also tagged with a location and have the "Show location" setting checked are automatically added to Google Maps Views and some of them are added to Google Maps. "Google Maps tries to algorithmically choose a variety of interesting, high-quality photos that give you a sense of place. To keep the focus on the location, photos that have people in them are typically not chosen," explains Google. You can check your storage here: mouse over the chart to see the breakdown. Update: Stephen Shankland from CNet found a post from the Panoramio group which says that Panoramio users will receive bonus Google Drive storage: "We will provide an easy way for you to migrate all your Panoramio photos, their metadata, and their viewcounts to Views. Your photos will be saved into public albums in Google+ and we will provide you a Google Drive storage bonus to cover the additional data usage." When you're signing in to a Google account from a different country, Google asks you to confirm your identity. 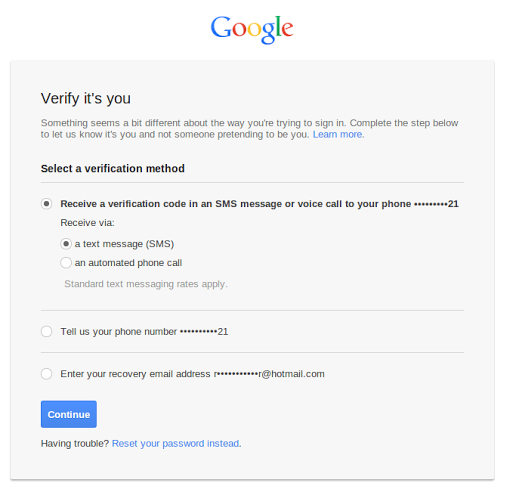 You can enter your recovery email address or phone number, enter a verification code received in an SMS messages or voice call and now you can enter a code generated by your Android device. 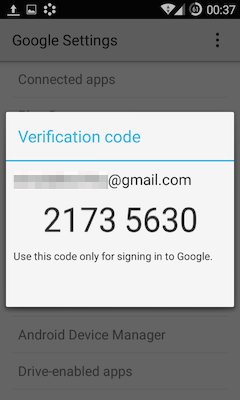 "If you're signing in from a different location than you usually do, we may ask you to enter a code from the Google Settings app on your Android phone or tablet to make sure you own the account. You don't need an internet connection or phone/SMS connectivity to get codes using this app." The Google Settings app is the UI for Google Play Services, Google's framework that delivers new features and APIs without installing a new Android version. It has nothing to do with the built-in Settings app, which is part of the operating system and can't be updated by Google. 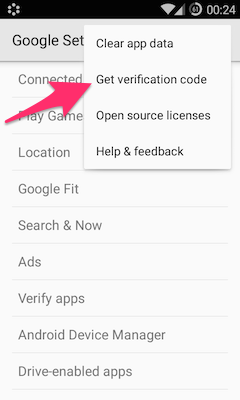 The verification code has 8 digits and it can be obtained by opening the Google Settings app, tapping the menu button and selecting "Get verification code". Chrome's latest Canary release has an updated offline error page. It still includes a small dinosaur image, a funny way to show how quickly your computer can become a relic from the past without an Internet connection. The error page has an Easter Egg: if you press space, it lets you play a game. "Your only goal is to avoid hitting cacti. The T. Rex jumps by hitting the space bar. 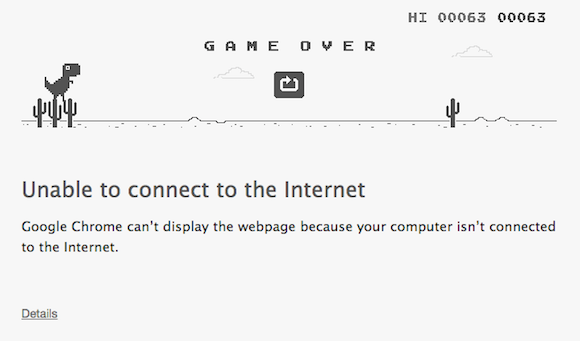 Fret not if you do hit an obstacle, because Chrome T. Rex doesn't stay down for long. (Hit the game-over refresh icon, and you're back at it.) The game tracks your progress and high score, but stats are lost if the window closes or is refreshed," reports Mashable. Google has an animated doodle for its 16th birthday. It's not a game like last year's doodle, but it's still funny. 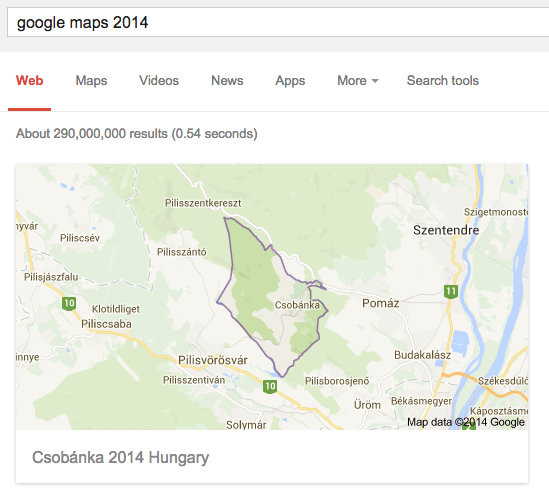 This time, Google shows the world how much it has grown. "When's Google’s birthday? I'm not sure even we know – we've celebrated on September 7th, 8th, 26th, and, most recently the 27th. Still, while there’re some differing opinions about when to bust out the candles and cake, one fun fact is that our first doodle was posted even before Google was officially incorporated," says Google. You can find Google's previous birthday doodles on this page. 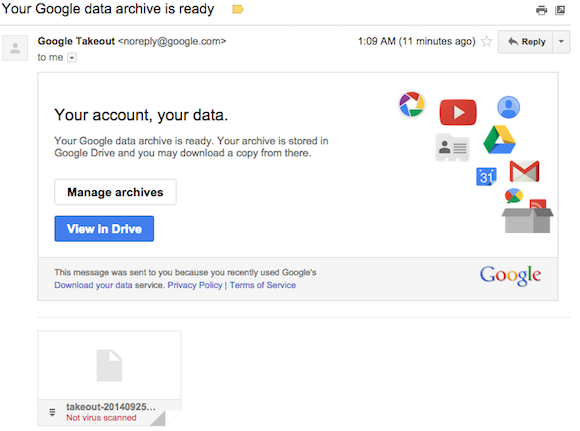 Google Takeout has a new interface. 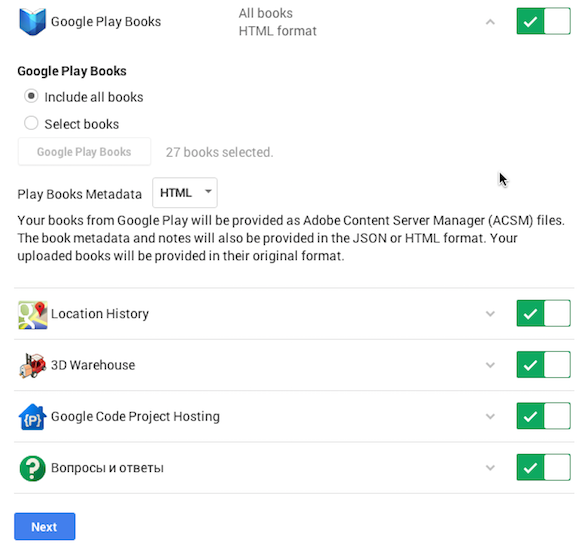 It's easier to pick the services you want to include in an archive and you can now store archives in Google Drive. "After we finish creating your archive, we will add your archive to Drive and email you a link to its location. 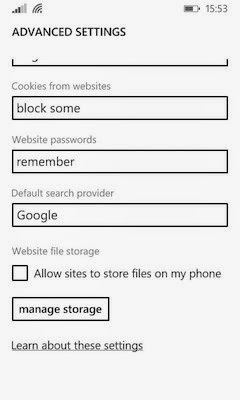 These archives will count against your storage quota," informs Google. 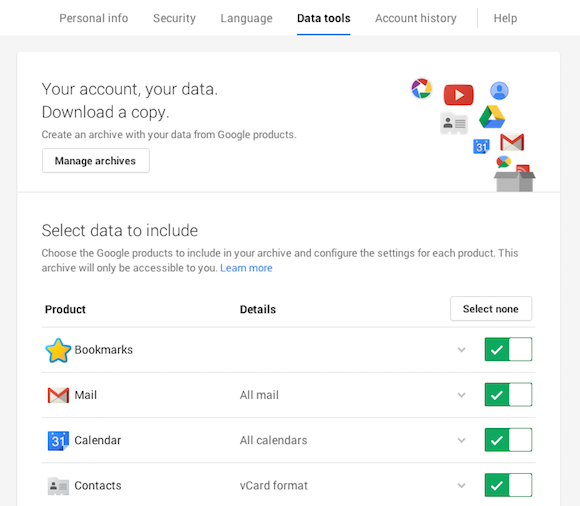 Some services let you select the data you want to export: Gmail labels, calendars, Google Drive folders, Blogger blogs, Google+ photo albums, books. 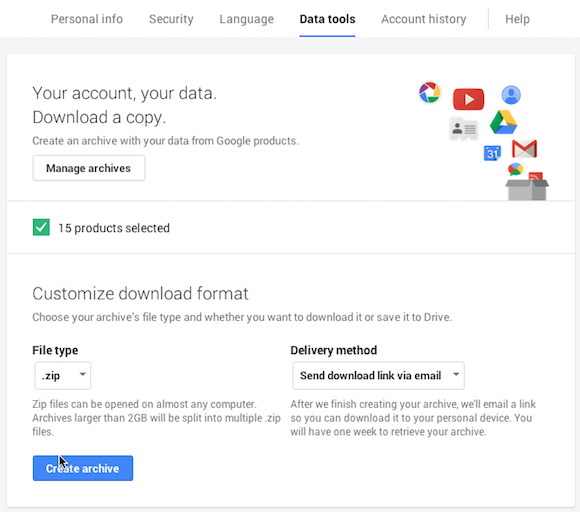 Google can create a download link that expires after a month or save the archive in Google Drive. Imagine exporting your data, saving the archive to Google Drive and then exporting your data again. This time, you'll also export the archive you've previously created. It's a good idea to exclude the Takeout folder from Drive, which stores your Takeout archives. If you've changed the search provider to Google in Internet Explorer for Windows Phone and you're wondering why search suggestions aren't that great, there's an explanation: Internet Explorer shows suggestions from Bing even if you're using Google. 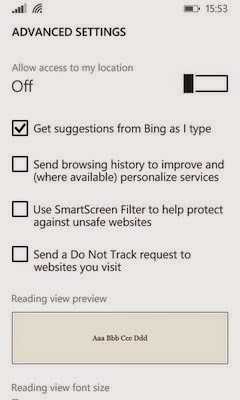 If you go to IE's advanced settings, you'll notice that you can enable or disable "get suggestions from Bing as I type". 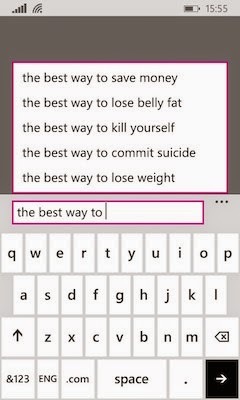 To get Google's suggestions, you can go to google.com, install Google's app for Windows Phone or install a different browser. So why would Microsoft show Bing suggestions if you've changed your search provider to Google? Maybe it's an excuse for Microsoft to send all your queries and partial queries to Bing, so that it can improve its search engine. Update. Hadrien Zero-Un has an explanation in the comments: "Internet Explorer for Windows Phone can't have Google as a search engine. BUT Nokia modified the browser to allow the change of the search [engine]." A few weeks ago, I noticed that Google shows facts next to some Wikipedia results. 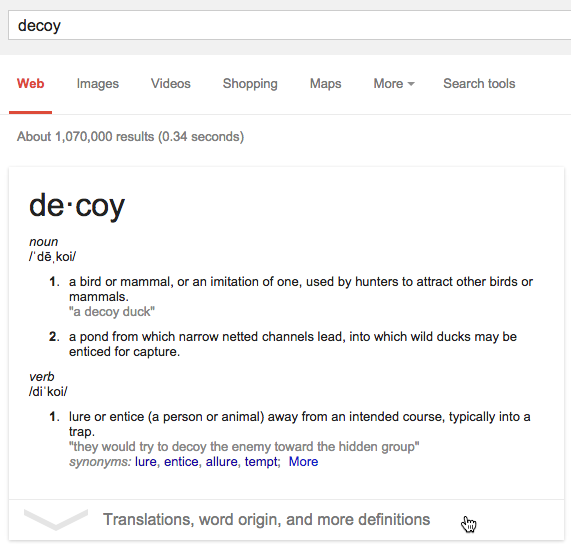 This feature is called Structured Snippets and it's not limited to Wikipedia results. "Structured Snippets is a new feature that incorporates facts into individual result snippets in Web Search. As seen in the example below, interesting and relevant information is extracted from a page and displayed as part of the snippet for the query [nikon d7100]," informs Google. "Structured Snippets is the latest collaboration between Google Research and the Web Search team employing that data to seamlessly provide the most relevant information to the user. We use machine learning techniques to distinguish data tables on the Web from uninteresting tables, e.g., tables used for formatting web pages. We also have additional algorithms to determine quality and relevance that we use to display up to four highly ranked facts from those data tables," mentions the Google Research blog. You don't need special formatting: Google extracts information from existing tables. 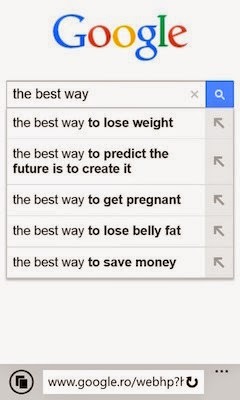 It's interesting to notice that Google has always used tables from web pages to extract useful data. Google Sets, one of the earliest Google Labs services, used lists and tables from web pages to generate lists of related terms. 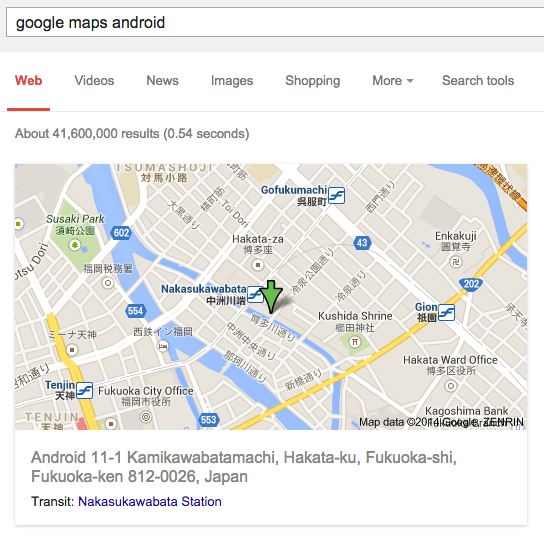 Google also built a search engine for tables and shows data from tables in cards and snippets. 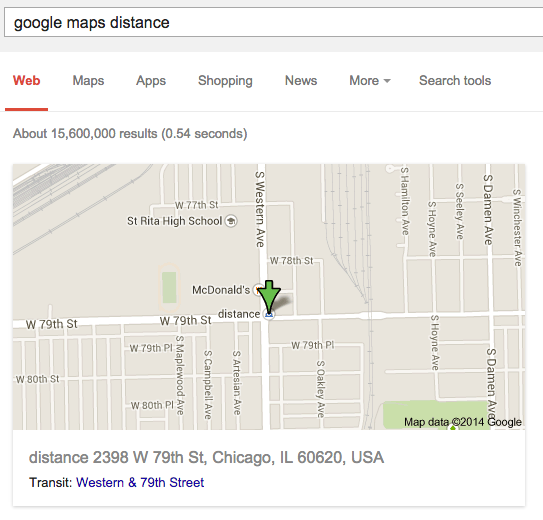 When you add "google maps" or "map" to a Google query related to a location, it's likely that you'll see a Google Maps card. 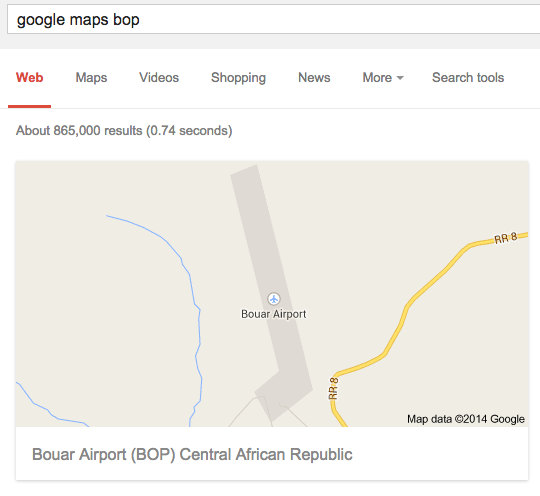 For example, searching for [google maps bop], [map bop] or [bop map] returns a map for the Bouar Airport (BOP) from the Central African Republic. Sometimes this feature doesn't work very well. 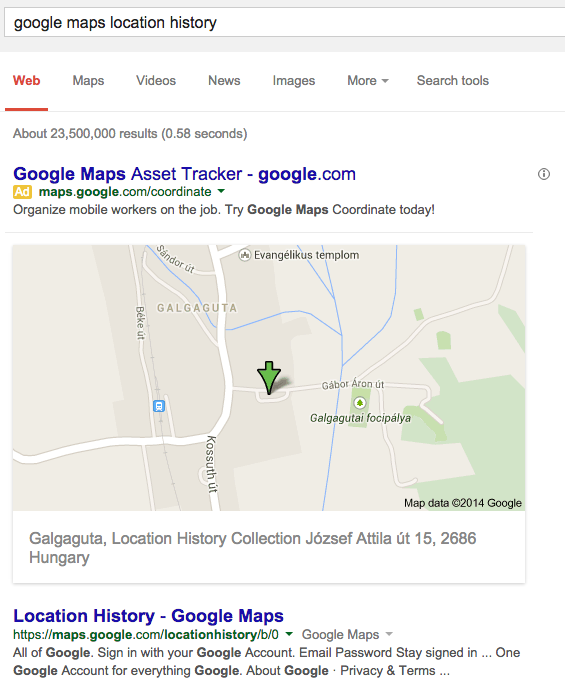 I searched for [google maps location history] and Google returned this map for Location History Collection, a museum from Hungary that appears to be permanently closed. It's obvious that the Google Maps Location History page is more important and should be displayed first. 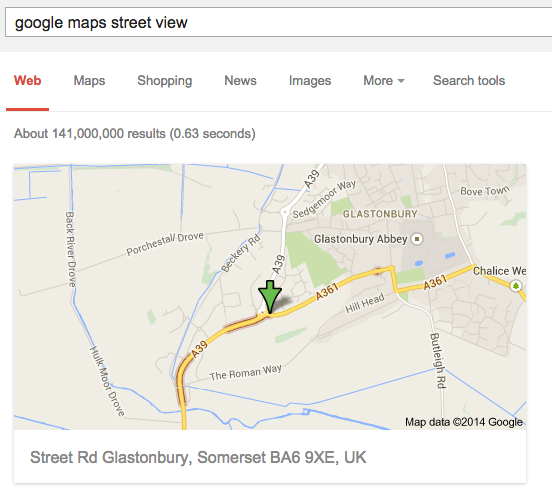 What about [google maps 2014]? And it's not just about Hungary. 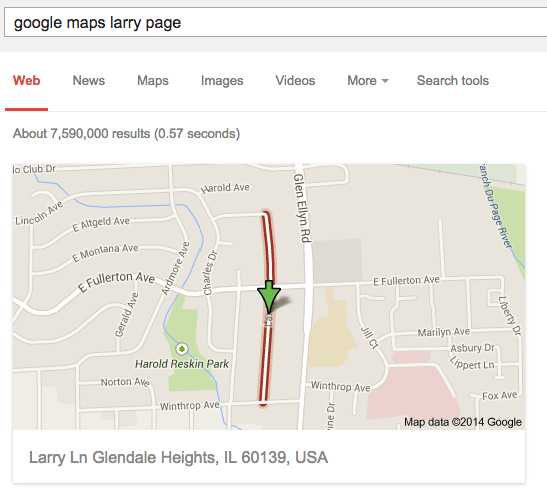 Even Larry Page has a Google Maps card. 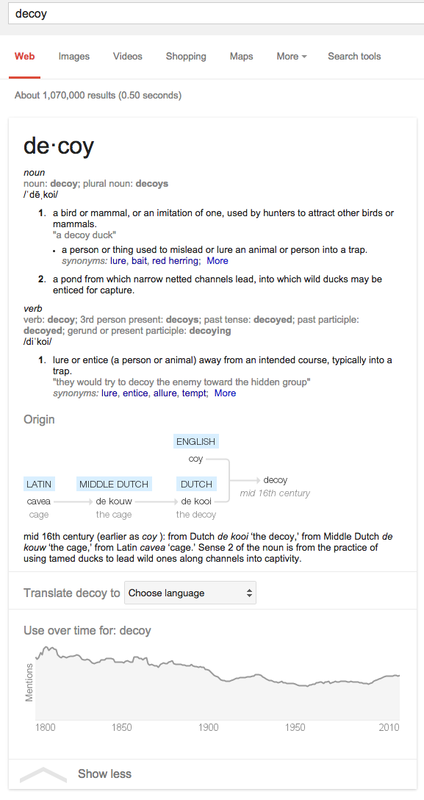 Google updated the dictionary card and it now includes a message next to the big arrow at the bottom: "Translations, word origin, and more definitions". Probably many users didn't realize that the card can be expanded to show even more definitions and some additional information. When you create a Google account, Google no longer forces you to join Google+. 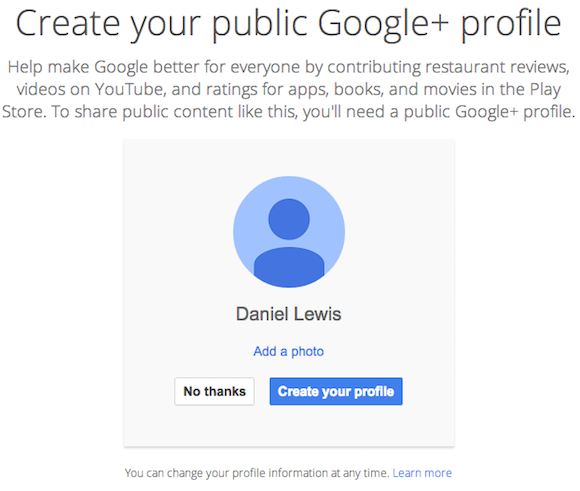 Google only asks you to create a public Google+ profile, but you can click "No thanks" and avoid upgrading to Google+. A Google spokesperson confirmed the change to Quartz: "Users can now create a public profile during signup, or later, if and when they share public content for the first time (like a restaurant review, YouTube video or Google+ post)." Google has removed the "real names" policy and made Hangouts available to Google Apps users who don't have Google+ accounts. It's likely that Hangouts and Google Photos will become standalone apps that don't require Google+. As Google+ fades into the background, it's time to open Google's apps to everyone and transform Google+ into a social enhancement instead of a requirement. 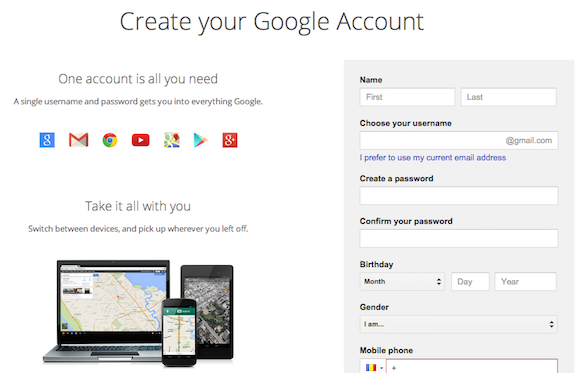 Back in 2012, creating a Google account from the Google homepage meant joining Gmail and Google+. Some time ago, Google added the option to use an existing email address and now you can bypass Google+. 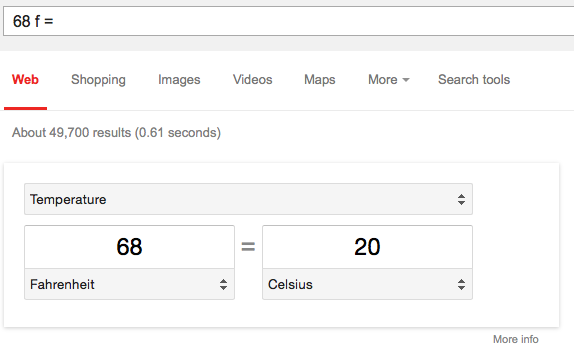 Here's a simple way to use Google's unit conversion feature, while typing shorter queries. 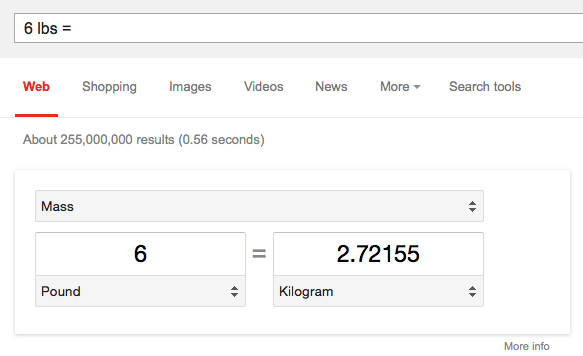 Instead of searching Google for [6 lbs to kg], you can use [6 lbs =]. Just add the equal sign to the value you want to convert and Google will use the right measurement unit most of the time. Here's another example: [68 f =]. The query is shorter than [68 f to c] or [6 fahrenheit to celsius]. Unfortunately, [20 c =] doesn't convert temperature, since c is the speed of light, so you'll have to use [20 c to f]. You can use Google's dropdown to pick other measurement units or you can edit the value and the result will change as yo type. Blogger updated the dialog that lets you insert photos. Now it uses horizontal tabs, just like in Gmail. 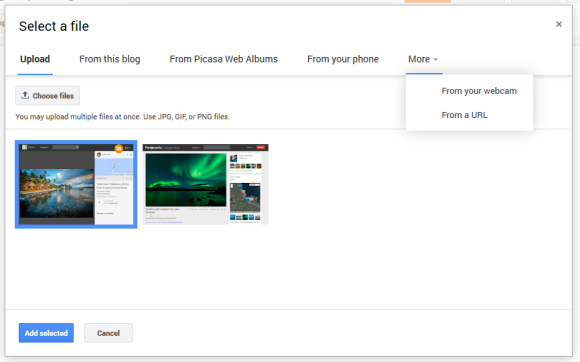 You can upload photos, add photos from Picasa Web Albums/Google+ Photos, capture photos from your webcam or paste URLs. Blogger's dialog has special sections that restrict Google+ Photos to images from your blog or from your phone (Auto Backup). 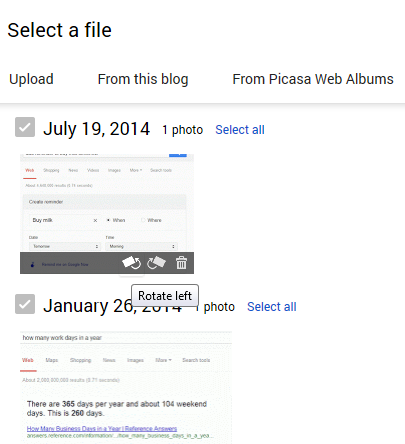 It's interesting that Blogger still uses Picasa Web Albums instead of Google+ Photos, while also including a feature that's only available if you use Google+: Auto Backup. 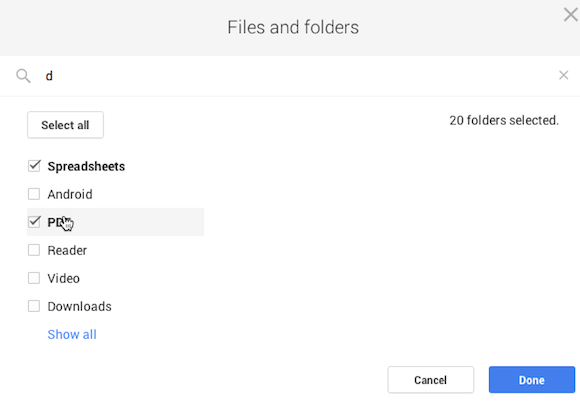 Blogger, Gmail and other Google services use the same Google Drive picker and customize it by adding a long list of parameters. Google acquired the photo sharing site Panoramio back in 2007 to add high-quality photos to Google Maps and Google Earth. Last year, Panoramio's team launched Google Maps Views, a community site that lets you upload panoramic images and geotagged photos. 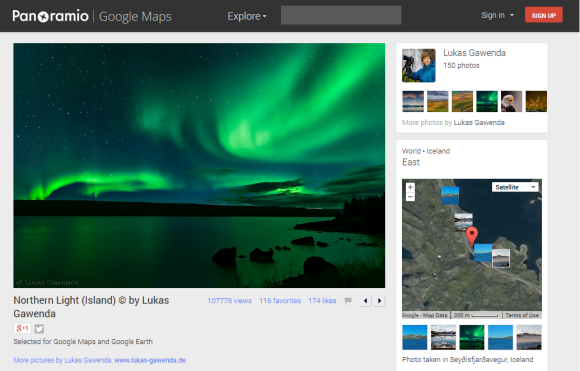 Now Google Maps Views uses publicly shared Google+ photos and it will replace Panoramio. 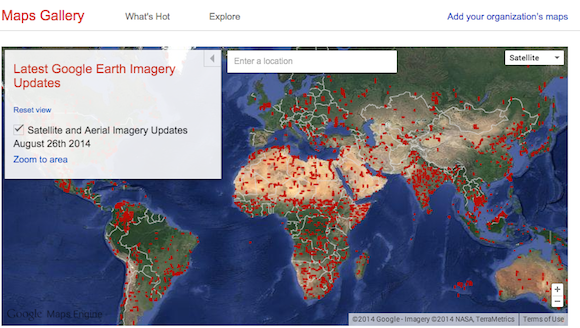 "Over the past year, we've developed a similar community in Views, which lets you publish geo-relevant content (photo spheres and traditional photography) on Google Maps. In the future, we plan to migrate Panoramio into Views, creating one destination where you can publish and peruse imagery from around the globe. Before migrating any imagery, we'll make sure that Views reaches a level of feature maturity that supports the needs of the community," says Evan Rapoport, Product Manager for Google Maps Views. Most likely, Google hopes to add more photos to Google Maps and to build its own community of users that make the Google Maps better by uploading great photos. "Views is a Google Maps community where you can share photos that help other people explore the world and decide where they want to go. 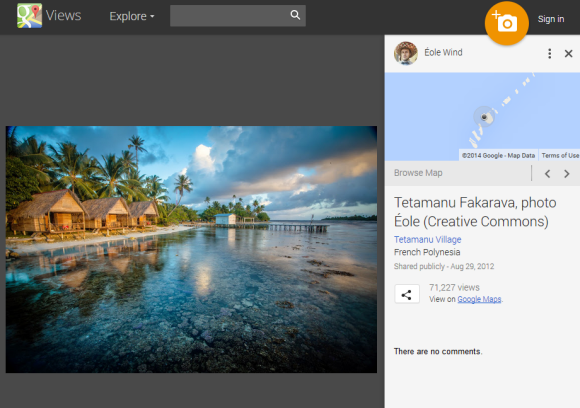 If you publicly share photos with a location on Google+, they may also appear on your page," informs Google. "We want to let you know that in the coming months, we're upgrading the content you created in My Maps. All of the maps that you've created will automatically move to the new Google My Maps (previously called Google Maps Engine). Classic My Maps on maps.google.com will no longer be available." So all the custom maps you've created in the old Google Maps interface will be automatically migrated to the new My Maps. 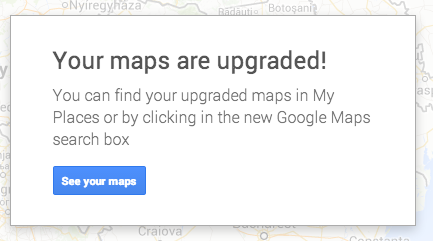 If you don't want to wait, you can go to My Maps and click "upgrade now". 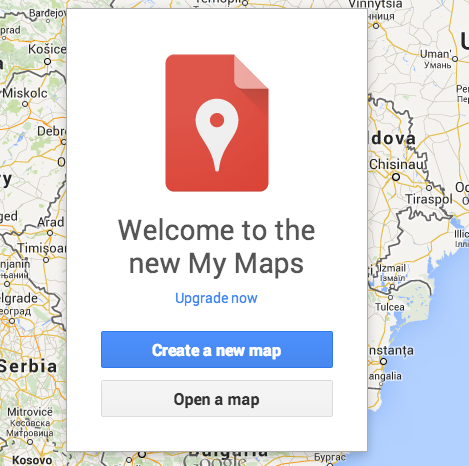 "Upgrading your maps is permanent and takes just a minute or two," informs Google. "The new My Maps is a more powerful maps creation tool that makes it easier to edit and share maps you've made. Just like with classic My Maps, you can work on a map with others, save driving directions, add photos and videos, and more." There are some limitations and restrictions, since Google also has a paid version called My Maps Pro, which is better suited for big maps. The new My Maps (previously known as Maps Engine Lite) is more powerful than the old My Maps as it uses Google Drive sharing, has support for layers, it lets you import locations from spreadsheets and more. 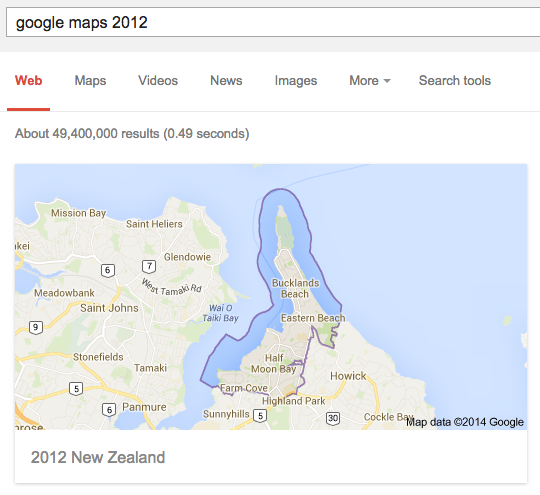 The main difference is that My Maps is a standalone site and you can't create custom maps inside Google Maps. You can see a list of recent custom maps and there's a button that lets you create maps. 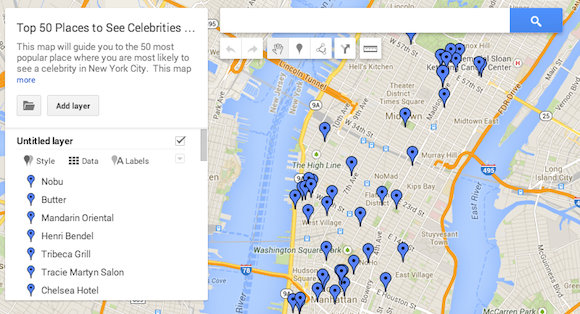 Google has an Android app for My Maps and a gallery that features publicly shared custom maps. "The possibilities are pretty much endless—students have photographed and mapped a city's public art installments, authors have laid out their stories' locations on the map, and activists have plotted out shelters and distribution centers during emergency situations," mentions Google's Lat Long blog. 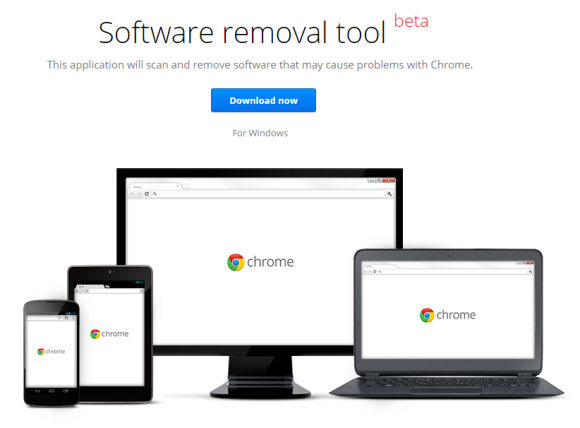 Google released a Software Removal Tool that "scans and removes software that may cause problems with Chrome". It's Windows-only, still in beta and it tries to detect if you've installed software that changes Chrome's settings without informing you about this. There are applications that change Chrome's new tab page, change the default search engine, add toolbars, insert ads. 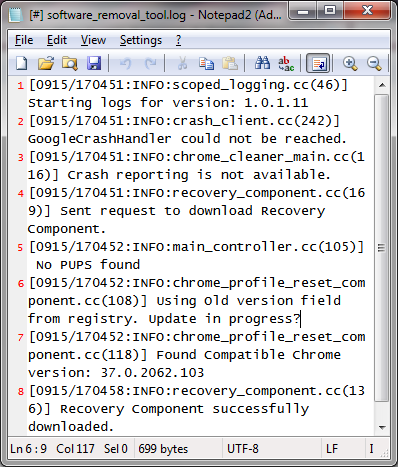 "If you notice Chrome behaving strangely (for example, showing you unusual startup pages, toolbars, or pop-up ads you can't get rid of), it may be due to an unwanted program on your computer. You may be able to fix the problem by downloading and running the Software Removal Tool. Think of this as a 'factory reset' of Chrome. It restores Chrome's original settings and removes programs that affect its behavior," informs Google. It's interesting to notice that Google's tool doesn't show a list of unwanted programs: "To discourage attackers from changing the names of their programs, the Software Removal Tool does not reveal the names of the suspicious programs it finds. You'll only see the number of programs detected." Google SRT (Software Removal Tool) doesn't scan for malware, so it doesn't replace antivirus software. I installed Google SRT and it quickly displayed this message: "no suspicious programs found". It looks like Google's blacklist is not very long. Google also opened a new tab in Chrome that asked if I want to reset browser settings: "Your browser settings will be restored to their original defaults. This will reset your homepage, new tab page and search engine, disable your extensions and unpin all tabs. It will also clear other temporary and cached data, such as cookies, content and site data." 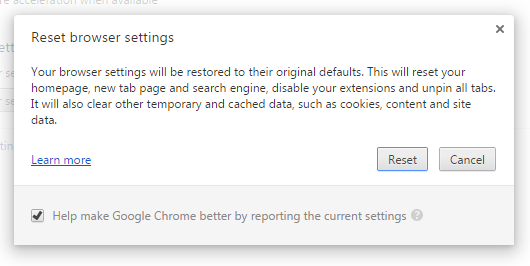 You can close the tab or click "Cancel" if you don't want to reset Chrome's settings. 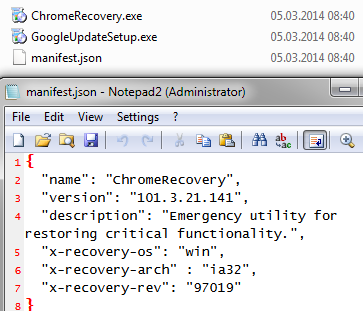 Google SRT downloads ChromeRecovery, an emergency utility for restoring critical functionality. 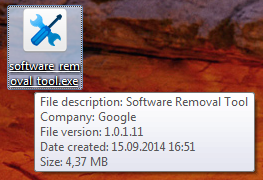 Software Removal Tool has a cool codename: Chrome Foil. Foiling means "preventing something considered wrong or undesirable from succeeding".